Anthropics have launched Portrait Professional 10, a new version of their popular portrait airbrushing software. Billed as “the world’s first commercially available software that is trained in human beauty”, the program has analysed thousands of photos to “learn” what makes people look attractive or unattractive. Version 10 offers a new UI, improved face beautification, enhanced slider controls, better Saved Slider presets, improved brushes, a new Child mode and a new Enhance Skin Only mode. Compatible with Windows 7, Vista, XP, 2000 as well as MacOS X 10.4 or better, Portrait Professional 10 is available in three different editions priced from $39.95/?29.95/€34.95. 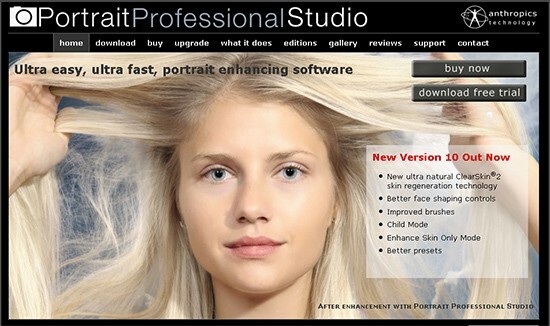 Portrait Professional is the world’s first commercially available software that is trained in human beauty. This makes it both faster, and much easier to use than ordinary photo editing software for faces. How is this possible? The software has analyzed thousands of photos to learn what makes people look attractive or unattractive. With this knowledge, it knows how to improve any aspect of the face. For example, if the face has a double chin, Portrait Professional ‘jaw slider’ will recognize that, and automatically reduce it. The results are fully customizable via a simple slider interface, so that users can get exactly what they want. There are over 200 sliders, giving the user total control of all aspect of the face and hair. Uniquely, Portrait Professional 10 keeps learning. The software is constantly receiving more training, so it is continually getting better at enhancing faces. And as V10 buyers will get free and frequent upgrades, their software will just get better over time. The software incorporates a unique intelligent edge finding touch up brush. Instead of just selecting everything under the brush, the brush actively looks for defects within its radius, and only removes the defect, leaving good skin untouched. This both gives better results, and makes the brush very fast and easy to use, as accuracy is not required. The software also contains a unique automatic ‘skin regeneration’ capability. Conventional skin touch up software simply filters the skin. This works OK for small defects, but fails with bigger problems. This is because when a large defect is removed what remains is featureless skin with no texture. Our solution is to automatically ‘graft in’ real skin texture where the defects used to be, and this is precisely what our (patent applied for) ‘Clearskin 2®’ software does. And depending on the age and skin type of the subject, the user can even choose different skin textures to fine tune the result. Far easier to use than traditional touch-up software for faces and hair. Much faster than traditional touch-up software. What exactly can Portrait Professional do? Automatically eliminate skin blemishes such as spots or pimples leaving completely natural looking skin, however big the blemish. Remove grease, sweat or unsightly white highlights from the skin. Reduce or remove wrinkles and lines, again leaving exceptionally natural looking skin. Subtly re-shape different aspects of the face to make it slimmer or more attractive. Adjust the lighting on the face to make it more flattering or remove shadows. Brighten or change eye color, and enhance whiteness of the eyes. Whiten teeth, recolor and re-shape the lips. Thicken, color and smooth hair. This is the stand alone version that offers all of the sophisticated face, skin and hair touch-up facilities but does not include the Photoshop® plug-in, ‘batch mode’ productivity features or the RAW file support that professional and semi-professional photographers require. Aimed at keen amateur and professional photographers, Portrait Professional Studio can be configured as stand alone or as a Lightroom® or Photoshop® plug-in to speed workflow. It also works directly with RAW files. The premier edition of the software, Portrait Professional Studio 64 is optimized for maximum performance on computers running 64-bit operating systems. Capable of handling the largest file sizes, this edition is for those who require the maximum quality in their work. Portrait Professional 10 has benefited from a massive amount of new training in face enhancement, and is now far better at improving different face types, and much better at male faces. This training initiative is continuing, so each new minor release of V10 (free to buyers of V10) will show further improvement. Portrait Professional 10 incorporates the latest generation of our ClearSkin® skin enhancing technology. This enables real skin texture to be regenerated and now incorporates a better algorithm and different textures for different types and ages of skin. This enables the most it easy to make any skin look great, while keeping it looking natural – no more plastic-looking airbrushed skin! Portrait Professional 10 gives the user more control over the results with more and better sliders. There are new sliders to control all aspects of the nose, better eye controls, face shape controls and an ‘Exaggerate’ slider to achieve more dramatic results when required. The software’s ‘intelligent’ skin defect ‘detection and removal’ brush has been significantly improved as have the ‘skin and hair selection brushes, which automatically find the edges of the skin and hair. This means that accuracy is not required and brushing is very fast and easy. Child Mode makes it easy to make appropriate changes to children. Portrait Professional 10 has been trained to understand the enhancements that work with children, and will apply them automatically. In response to many user requests, Portrait Professional 10 now has an Enhance Skin Only Mode, when the user does not want to make any changes to the shape of the face being improved. Portrait Professional 10 incorporates a completely revamped set of preset beautification effects, designed to make it even easier to quickly make anyone look great in a photo. Portrait Professional 10 has a new interface, designed to make workflow as streamlined as possible.